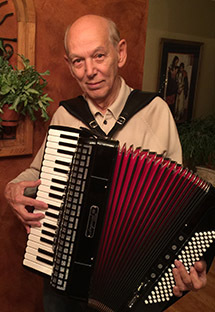 Jerry King is a professional accordionist who is considered a virtuoso in his field by many. He has worked professionally since the age of 13 and studied at the Chicago School of Music. Jerry's repertoire seems endless, knowing thousands of songs from memory and playing your favorites upon request. He features standards, love songs, movie themes, show tunes and ethnic music, and at times may add a hint of jazz where needed. His present engagement is, being house musician at caffe De Luca in Forest Park, IL. His past engagements include La Creperie since 1987 and Carlos’ Restaurant (now Nieto’s) in Highland Park, IL since 1989. 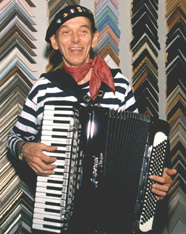 On 12-2-2010, a customer where I'm employed steady stated, "Anyone who doesn't like the accordion has never heard you play." Believe me that made my day ! It was the most sincere and genuine compliment I have ever received . . .
Let Jerry King and his music add the finishing touch to your very special occasion. Contact Jerry at 773-671-4440 or 773-465-0028 or accordionmyway@aol.com.